Blue Marlin is a petit restaurant that is quite popular with tourists and offers a taste of the Cape Verdean cuisine. This small restaurant has an extensive sea food menu and besides its tasty dishes is also a popular destination for a simple coffee and not so simple beer. The restaurant has extremely friendly staff and a perfect service to go with the delicious food. 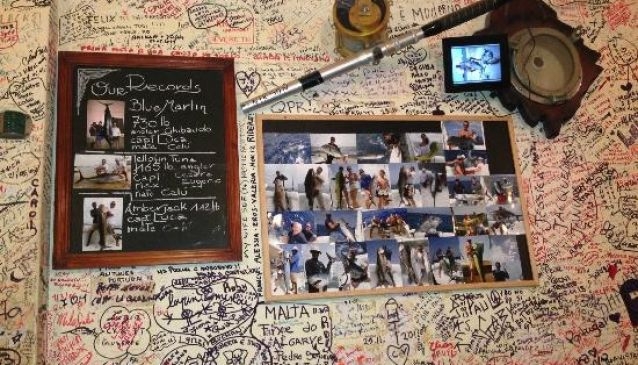 It features a fan wall where all the people who have visited it write something about their experience in Boa Vista and Blue Marlin Restaurant. Located on Placa Santa Isabel this restaurant is in the very centre of Sal Rei and close to all the souvenir shops and everything else you might need.